A close-up view of Apollo 17 lunar rock sample no. 76055 being studied and analyzed in the Lunar Receiving Laboratory at the Manned Spacecraft Center. 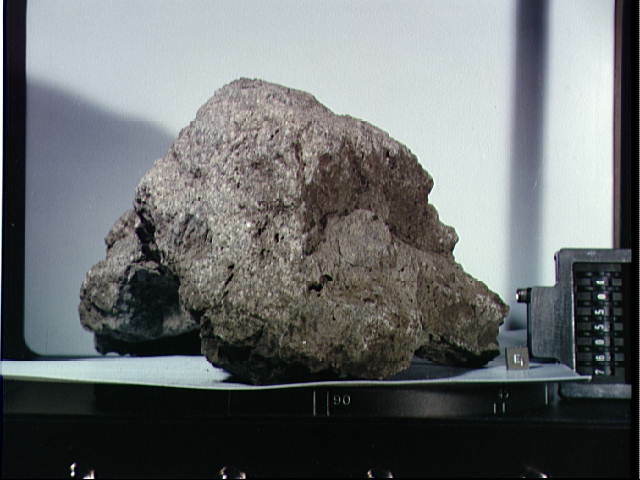 This tan-gray irregular, rounded breccia was among many lunar samples brought back from the Taurus-Littrow landing site by the Apollo 17 crew. The rock measures 18x20x25 centimeters (7.09x7.87x9.84 inches) and weighs 6,389 grams (14.2554 pounds). The rock was collected from the south side of the Lunar Roving Vehicle while the Apollo 17 astronauts were at Station 6 (base of North Massif).